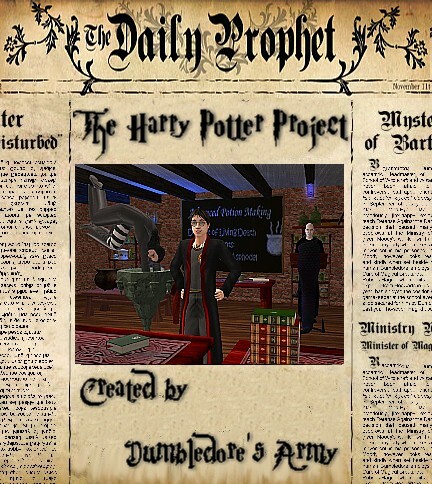 The Harry Potter Project is designed to bring the magic of the Potter books to life in your Sims 2 game. Witches and muggles alike will feel right at home with this big set. It's as close to a magic expansion as we're going to get. In the following posts, you'll find characters, clothes, recolours and a brand new magical skill, complete with magic supplies. Our thanks to everyone who has helped this project along, including all original HP forum members, Numenor and especially Delphy and the staff. - Please don't steal our work. - Don't upload the sims or their custom content without permission. - You're very welcome to recolour the objects found here, but please link to this thread for the meshes. - You're allowed to remesh the hacked objects, but please give credit to the original creators, and post a link to this thread with your upload. - We like to know about recolors and additions! Please tell us about them so we can link you here. - All downloads come with a readme file containing all necessary information. Please read those before asking questions. The downloads are also in rar archives to save on bandwith and serverspace. Please do not ask for zips or single, grouped uploads. Just use Q-Xpress and click the little Q icon instead. There's simply too much here to make different versions of archives Thank you. - You will find the downloads in the first few posts of this thread. Click on the link that says Click here to view all Comments / Feedback to open them. - And just for good measure. We will not be posting zip files. Update apr 14: Added a new version of the haunted painting. This should work for non-ep versions. If you had problems with the old one, please redownload. It'll overwrite the previous package. Update apr 15: Repackaged the Bloody Baron. My apologies to Tabala. 6502 people have said thanks to Dumbledore's Army for this download. NEW! Default alien face replacement | Pretty alien babies guaranteed!